What I saw of Heart of Thorns at Gamescom looked like tremendous fun. Not fun in the abstract sense that we might describe a game that’s actually tense or gruelling, but genuinely joyful and carefree. 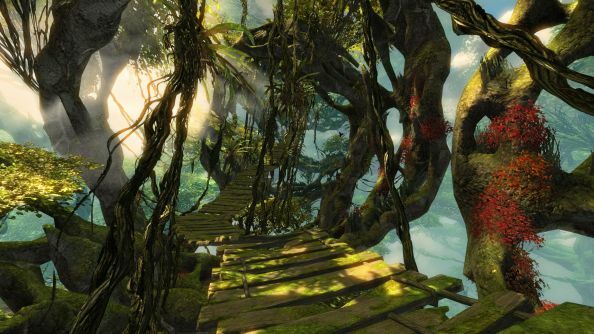 The new Guild Wars 2 expansion is filled with bouncing mushrooms and forest gliding opportunities. It feels like a gloriously silly natural endpoint for all the MMO’s past platforming challenges. A launch trailer showcases the thornier side of the story, rendered in that still-beautiful wispy art style. There’s something Ghibli-esque about Guild Wars’ new vine-acular villains. See what sits alongside Guild Wars 2 on our list of the best MMORPGs. Heart of Thorns is go, greenlit and green-fingered. Guild Wars 2’s box price dropped to nothing a few months ago, but the expansion costs £34.99 on the ArenaNet store. The studio are currently celebrating seven million accounts made – the latest milestone in an MMO that’s provided longevity through its episodic Living World premise. About 40% of level 80 vets playing that weekend turned up to greet starter players. And the other illuminating percentage is the 135% growth in PvP participation over the last year – an area ArenaNet are forever pushing. Apparently there’ve been 1.4 billion hours of Guild Wars 2 played to date. How many of them are yours?